Welcome to Overstrand. 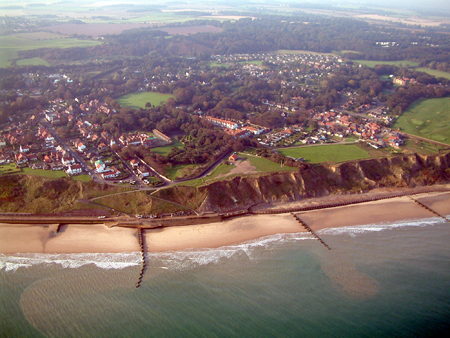 The village stands on the north east coast of Norfolk, overlooking the North Sea. This site is being developed as an extension to the Overstrand Our Village DVD which has been commissioned by Overstrand Parish Council. In our multimedia world, print, video and the inter-activity of the computer all come together to help us understand our history and our heritage. If you like to visit the web site that carries general information on the village, click on Overstrand Online You'll find details of current events, photo galleries, a history of the village, places to stay, places to eat out - all designed to help you enjoy living in the village or making a visit to a fascinating spot. If you'd like to start with the Overstrand Our Village DVD, you can purchase it at several places in the village. You'll also find it at bookshop, museums and other outlets throughout East Anglia. If you'd like a copy sent to you, then there's an online purchase service available from Poppyland Publishing. Our modern technologies enable us to record our memories in print, in photographs, in audio format and on film and video. Members of the Overstrand community have generously contributed to this project in all these ways. We hope you'll enjoy all that they've had to offer as you look around the site. This map from Google will show you where Overstrand is. You can use the normal Google Map controls on the left hand side to zoom in and out. The buttons top right will enable you to change the type of map you're looking at. We use a number of facilities from Google elsewhere on the site. If you find you're using the Google Earth facility, the controls are a little more difficult to use but extremely powerful in the way they allow you to view the earth.